My collection is getting to be a bit eclectic. Most are in English, of course, but there are a few in Spanish and more then a few in French. I even have one book of Spanish recipes in French. This recipe is based on one from a book called ‘cuisine de la médina’. 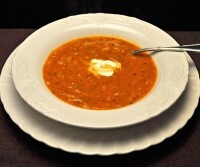 The name of the soup, in French, is ‘Soupe tunisienne aux langues d’oiseau;. Just so you know – the bird toungues are pasta, similar to orzo…. Not real bird tongues. Sauté onion, garlic, celery and carrot in medium saucepan in olive oil over medium heat for 5 minutes. Add tomatoes, stock, herbs, spices and bring to a boil. Add pasta and cook 15 – 20 minutes, stirring often to keep it from sticking. Ladle the soup into bowls. Top with a dollop of yogurt, sprinkle with sliced preserved lemon and serve. Another new cook book in my library is Cook’s Illustrated: The Science of Good Cooking. I’ve only looked at the magazine a few times… It always seemed a bit dry to me. This book, on the other hand is wonderful. It’s all rather technical stuff but they explain it very well. Most importantly, for me, is that the science or at least, the reason why is thoroughly tested and tasted and explained. Like the one that drives me crazy every time I hear a chef say it: ‘Sear the meat to seal in the juices’. They’re not putting glue on the meat….. how are they going to seal it? And don’t they ever look at what they’re cooking? Searing adds flavor, yes, but it doesn’t seal anything. Do copper bowls really make a difference for whisking eggs? How much alcohol is left after cooking wine? Is flambé just for show or does it really do something? This is a great book for any kitchen nerd. It’s not something that you sit down and read cover to cover, but I find myself picking it up and getting lost for a bit more often than I should. Maybe I should just read the whole thing and be done with it. Oh – and there are recipes, too…. 400 of them. BTW, I bought both books. Living on this side of the pond doesn’t get me free books to review like my US blogging friends. I only tell you about the ones I like. Not fair, I skip reading if you’d warn it was about a cookbook I’d want to buy … and I was really looking forward to how/where you’d come up with bird tongues 😉 soup looks wonderful right now. It’s called birds’ tongue in Egypt as well. I am so trying this soup. I don’t like tomato soup much, but this sounds delicious. Check out my blog as well please. I have a question. I don’t have powdered ginger. How much fresh should I substitute? Also, by preserved lemon do you mean pickled or dried? 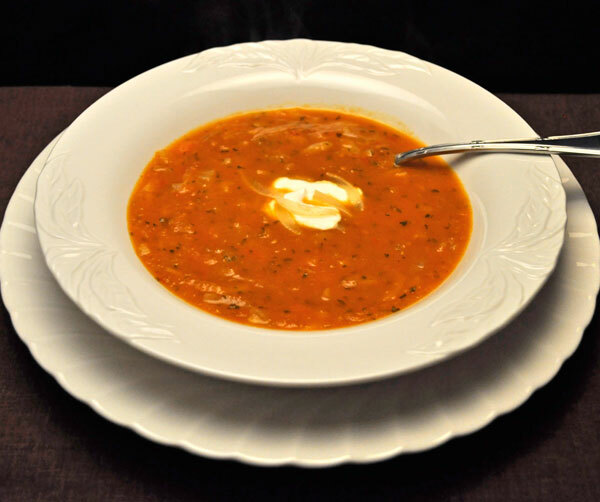 The soup sounds wonderful Katie…I could eat soup every day! I must be a cooking nerd, cause I like the sounds of the cook book too! Soup sounds wonderful but I’m not sure where I’d be able to buy preserved lemons by me. Where we recently moved from, yes. But out here…I dunno. I do want to try this though. It looks delicious. Tanna, is really is a great book for anyone who wants to know what and why something works…. Sorry. I did, Heather – loved the lamb stew. Ina, if spring doesn’t come soon I may run out of soup. I’ll just have to make more…..
nighstmusic, you can make them really easily – just lemons, water and salt. As to the copper bowls….Yes, they do make a difference (more volume, less ‘eggy’ flavor) but are not necessary. I have plenty of cookbooks too — not as many as you, though — but have pretty much stopped buying them. I feel like I have access to just about any recipe I could possibly want, and also don’t use recipes that much anymore. But sometimes I feel like I should sort through them, get rid of some, and start buying some more. 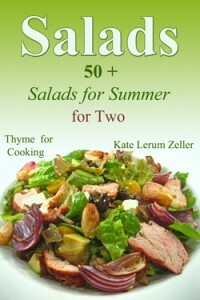 I would hate to contribute to the demise of the cookbook. Tell us the truth — how many cookbooks do you have? Well, I’m not surprised as I have at least 100, and I am nowhere near the food/cooking person you are!